So I’m sharing my budget a little early this month, as I’m writing this in advance since right now I’m… well, I’m not sure what I’m doing in France, but you can find out if you follow me on Snapchat (hellorigby) or Instagram. Shameless plug, sorry. Anthropologie: No, no, I’m not receiving free products from Anthropologie. (A girl can dream though!) Dave bought me this dress a couple of months ago, but I was just sure it was never going to come (it was back ordered for 2 months)… but it did! The only sad part is, it’s too tight in the shoulders and arms and last I checked it was completely sold out. I think they may have been playing mean tricks because it appears to be now back in stock in all sizes… sigh. Regardless it’s too late to reorder a size up (I ordered an XS, which was all that was left) because I’m having mine altered to remove the portion of the sleeves that is too small. Then, the tailor is using the “bell” sleeve part to make flutter sleeves and she’s dropping the armhole a bit to accommodate. The Collegiate Standard: I was sent this anchor necklace for review and styling. It’s a lovely sterling silver piece that goes with just about anything. If you love it too, you can enter to win one here through tonight at 11:59pm EST! 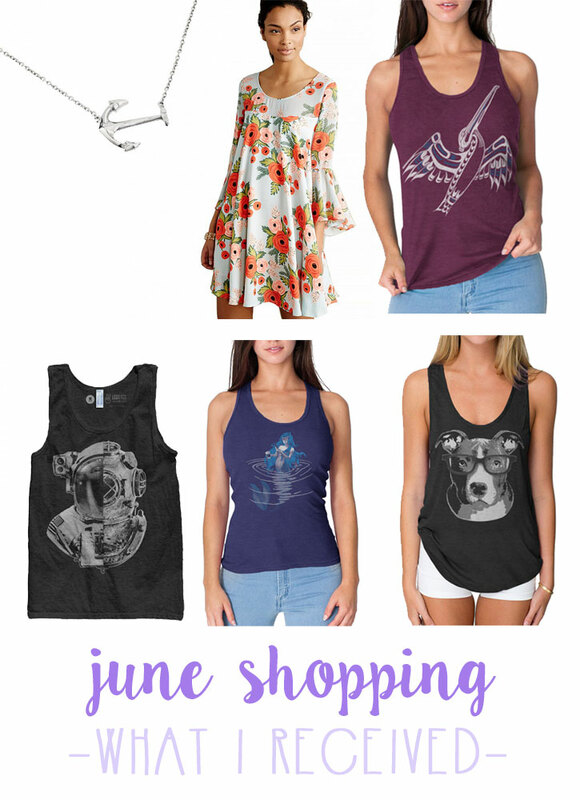 Legit Tees: You may recall seeing my funky hipster mermaid tank top last week, and I absolutely loved these unique tanks from local maker Legit Tees. I’m going to be styling the other prints I received throughout the summer months. What did you buy this month? I’d love to hear all about it! Oh yay so glad you found that DailyLook dress in your size, it’s SO pretty! Love that dress from Anthro too, so gorgeous! Haha, I doubt it but I’ve decided if I do want to wear it to the wedding I will ask the bride first! The dress and purse you bought are SO cute! I tried to be good this month, too! I bought a few things (lipsticks & stitch fix, mostly). I agree with the birkenstock return. They’re super cute, but I feel like the pattern would be hard to style. I have a pair of Gizeh Oiled Leather Birks and I absolutely LOVE them, though. They go with EVERYTHING. I’m glad you got that floral white dress! Very pretty! The blouse should transition well into Fall, too. (I’m all about year-round!) I like the NYX lip stuff… I think I have the same type, but in a different color. It feels really good! I can’t wait to hear what you think about the contouring pallet. I remember splitting shipping on ELF stuff or ordering enough for free shipping with my college roommate before you could get any of it in stores. The blouse will definitely transition well! The NYX lip creme is really good. Super soft and not drying at all which is always something I hate in lip products. I’m mixed on the ELF Palette. I was trialing a drugstore foundation with it and I’m not sure if it was the foundation or the palette that was causing the problem. I will definitely plan on a review of it though! I loved the original too, but at the same time the sleeves were a little overbearing on the dress on me. Short people problems. I picked it up today and I think it turned out really well, but I definitely would love to find a different dress that has similar sleeves to the original. I think I’m either going to wear this dress to the rehearsal to be safe, or ask the bride. It’s in October but it’s in Miami so I definitely need to find something on the lighter side! I love boho top! So cute! 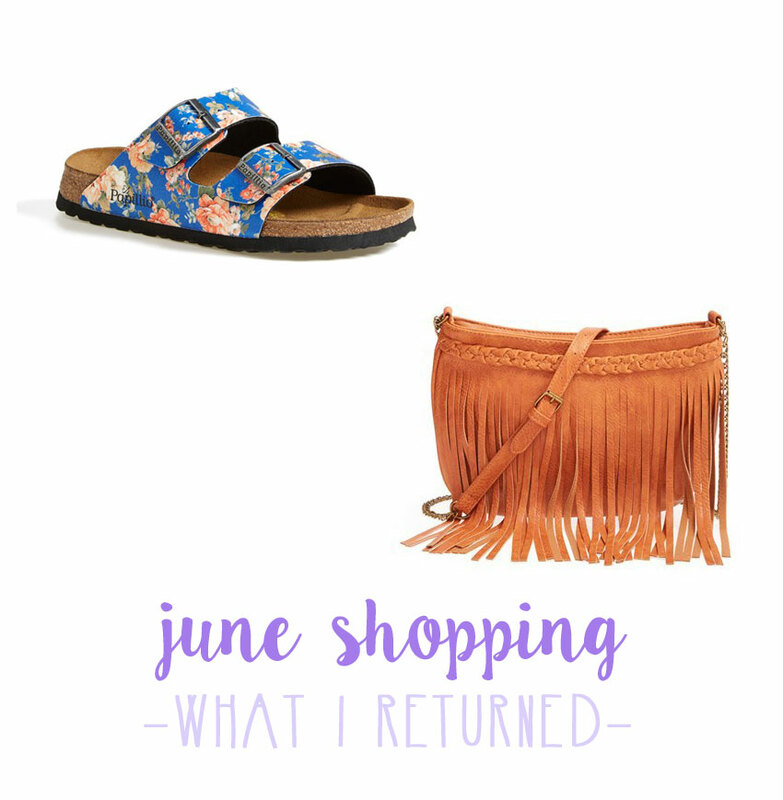 I saw that fringe bag when I was at Nordstrom yesterday and thought it was sooo cute! I didn’t feel it though, but I feel like a lot of bags in the BP section do end up feeling cheap. That’s too bad! Thanks Mattie! Definitely – it’s too bad so many of the inexpensive bags feel (and sometimes look) that way! I always hate when stuff is out of stock and then comes back into stock when you’ve already changed your mind or ordered something else instead- or in your case started alterations. The dress looks sooo pretty though and it sounds like it will fit you perfectly once everything is done. I love the first dress you got and think there’s definitely enough color and print to wear to a wedding! Such a bummer the fringe bag wasn’t as nice in person- it looks so cute! You did a great job with searching for deals and with using coupons and rewards. I love the blouse you kept from Stitch Fix, although right now I’m all about tanks because it has been way too hot for anything else! Thanks Lisa! I’m sure it’s much warmer there than here, haha! I went on a spending freeze this month so I only ended up spending $10 on 2 dresses that I found at a thrift store! I’m pretty happy about that. LOL! Dang, that’s awesome! Congrats on making it through a spending freeze! I can’t wait to see that dress after the alterations. I bet flutter sleeves are going to look so much prettier! I LOVE the Anthro dress and the boho top! Can’t wait to see how you style them! I tried on Birkenstock Arizonas this past month and I also wasn’t feeling them. I have rather wide feet, and the style is just not flattering for me. I also have wide feet, and you’re right, it’s really not a flattering style for that! I’m thinking I’ll wear the dress to the rehearsal dinner instead. They are close friends, so I may run the dress by the bride just in case she doesn’t mind, but I agree, it is a white base so it’s better to be safe than sorry!